We’d love your help. Let us know what’s wrong with this preview of Sands of Time by Christine Church. Librarian's note: See alternate cover editions of ISBN 1518815235 here and here. Mysteries uncovered from tombs. Secrets dug up from the grave. The truth about vampires has been unearthed. These are the journals of an ageless woman, a hybrid half human, half "Pet Mer," (Sky Gods in ancient Egypt). A blood drinker from the ancients. Their story is scarce told, but Kesi's is Librarian's note: See alternate cover editions of ISBN 1518815235 here and here. She appears a delusive goddess, wanting more than anything a family. Unable to bear children, and after the death of her husband, she travels the world searching for a way to share her bloodline ("creating" children, later known as "Vampyre"). She offers aid to those who need her. But her deep desire to have kin of her own blood is not met, until she comes across a Chinese alchemist named Yin - another of her race. Hope for a life with him is banished, however, by his dark desires to destroy all the world's hybrid offspring, to find a "cure" for the "blood drinking aberrations" created by those of his and Kesi's kind. Taking what she needs and leaving behind chaos, Kesi runs, always searching. Her everlasting quest takes her through history, from one continent to the next; from her home in Egypt, to China, Rome, Scotland, and finally France. But she is never able to outrun Yin, and eventually she must face her enemy and the darkness within herself in order to have that which she truly desires. To ask other readers questions about Sands of Time, please sign up. For such a small (approximately 80 pages) book, it packed a huge punch. I am so glad the author stayed away from the typical vampire reads often heard. You know the ones, I am talking about. The ones filled with horror and gore? You will find none of the gore here. Church's "Sands if Times: Fate of the True Vampires," tells of a tale where the vampire's origins extend from a god like status of a race called the Pet Mer. Once the Pet Mer and a human mated a hybrid was created. For example the her For such a small (approximately 80 pages) book, it packed a huge punch. I am so glad the author stayed away from the typical vampire reads often heard. You know the ones, I am talking about. The ones filled with horror and gore? You will find none of the gore here. Church's "Sands if Times: Fate of the True Vampires," tells of a tale where the vampire's origins extend from a god like status of a race called the Pet Mer. Once the Pet Mer and a human mated a hybrid was created. For example the heroine in this story is a hybrid name Kesi. The taking of human blood by force wasn't needed at the time of the Pet Mers living on Earth. Their godlike status meant that blood was often donated by people eager to serve them. Kesi's tale is the story of a woman hybrid who chose to remain on Earth after the Pet Mers returned home. Her story is a tale of survival. It is through her tales that the reader will see what happens when blood is no longer freely offered as food. This is an interesting and very different take on a vampire novel! It is written from journal entries from the main character, Kesi. Kesi is half Pet Mer (sky god) and half human. When her family needs to leave earth, she decides to stay with her human husband. The journal entries take us on a journey over a very long period of time and goes through Kesi trying to make a family to finding Yin (another vampire trying to find the cure). Yin is torturing people to try and find a cure for what he co This is an interesting and very different take on a vampire novel! It is written from journal entries from the main character, Kesi. Kesi is half Pet Mer (sky god) and half human. When her family needs to leave earth, she decides to stay with her human husband. The journal entries take us on a journey over a very long period of time and goes through Kesi trying to make a family to finding Yin (another vampire trying to find the cure). Yin is torturing people to try and find a cure for what he considers a disease. Kesi took one of his subjects and raised her like a daughter. When Yin comes looking for them, Kesi decides to fight him. The book ends with her starting to build an army to fight back. What an extraordinary and well written novella. It was as if Kesi herself was right next to me relating her story. I was quickly pulled in and hung on to every word and I traveled from ancient Egypt to Rome and Scotland and so many other destinations. This is truly not a typical vampiric read and I wish I could give it more than five stars. I can't wait for the release of the second book and I applaud this author's ingenuity. The format of the first person historical fiction was fun to read. I was unsure if I was going to get into the characters, but I did. 100%. Can't wait for book 2. Left me wanting more. This book is fresh and original. There's enough common with other vampires to satisfy other vampire fiction lovers, yet with a fresh perspective. Refreshingly good read. I won this book from the authors facebook page in a facebook live contest that she had . It is my first book by this author. I enjoyed reading it. It had a good story to it. I also won the three other books in this series from the same contest. I look forward to reading them. First thought about this book? It's a unique novella that's filled with mystery. I adored how the book is written as journal entries that the main character writes over a course of a thousand years, and is later found by archaeologists and translated. It's very interesting, to say the least. It's odd, but the entries are written so well and have such a clear voice it feels as if Kesi, the main character who wrote these entries, is a real person. I felt connected to her character from the first p First thought about this book? It's a unique novella that's filled with mystery. I adored how the book is written as journal entries that the main character writes over a course of a thousand years, and is later found by archaeologists and translated. It's very interesting, to say the least. It's odd, but the entries are written so well and have such a clear voice it feels as if Kesi, the main character who wrote these entries, is a real person. I felt connected to her character from the first page, but is impressive for an author to achieve in a character. Also, I enjoy how the author took the 'vampire' and turned it into something so cool and unique. I have read many vampire novels before, but this one is unique and can stand on it's own. I like how the 'vampyres' in this book are creatures derived from the stars and were seen as gods among the Egyptians. This novella follows the journey of Kesi, a vampire who's people derived by the skies and were seen as gods by Egyptians. We know her story by journal entries she has written over her many years on earth. She talks about her past, her falling in love with a mortal and how easy blood donors were found. But the times changed, and so did her life. No longer are people trusting of her people. No longer do they consider them gods and thought it an honor to let vampires feed on them. And within all these years of change, she loses her beloved husband, the only moral and man she passionately loved. Life had little meaning after her beloved husband's death, so Kesi seeks a family to call her own. She tries many methods, never giving up, but is met with failure after failure. She is unable to bear children, so she travels around the globe to find others like her, or their children that were left behind when they left this planet to find life elsewhere. What she finds is more than she bargained for. She meets Yin, a creature exactly like herself, but who has been successful in creating the very thing she has desired for centuries--a child. But Yin doesn't see making children as a gift. He thinks they are horrid creatures that should never be brought into this world. Kesi wants to know the secret to Yin's success, so she kidnaps his only progeny and together they go on the run from him. She's trying to save his progeny from Yin's horrible tests and torture, but Yin will now never stop until he has her back and has his revenge on Kesi for taking his experiment away. Kesi must stop running and face Yin. To destroy him before he can destroy her, her new child, and the future of their children. Honestly, there's so much about this book I love. I love all the characters we were introduced to, the main and minor characters, and I'm impressed that I liked the minor characters as much as I loved the main characters. The plot was fantastic, the writing is brilliant, and I can say with all honesty that I can't wait until the next book!! This book is definitely a must read! "Love never offers easy answers. But it guides our heart and the decisions we make and there is no way of knowing if that decision is right or wrong." "We are eternal. Time does not exist, but pain and suffering are forever." The premise behind Sands of Time is that ancient scrolls and journals were discovered, dating as far back as the times of Ancient Egypt, and originated from one source. This is Kesi's story, pieced together by different scholars. Prior to her marriage to Jabari, Kesi decides that it is imperative to confess her true nature and her lineage. With a father not of this world and a human mother, Kesi is one of the ageless race that survives on drinking human blood. As her quest for a family takes Kesi The premise behind Sands of Time is that ancient scrolls and journals were discovered, dating as far back as the times of Ancient Egypt, and originated from one source. This is Kesi's story, pieced together by different scholars. Prior to her marriage to Jabari, Kesi decides that it is imperative to confess her true nature and her lineage. With a father not of this world and a human mother, Kesi is one of the ageless race that survives on drinking human blood. As her quest for a family takes Kesi through many different lands and multiple generations, she must eventually face her enemy and her true nature. Sands of Time gives a very unique take on vampire origins from Egyptian times where the author uses ancient myths to create the historical origin of the Pet-Mer (Sky Friends). Centuries pass through the written journal entries by Kesi, a blood drinker, hybrid Pet-Mer. These bring the reader through many countries and experiences. Kesi is a very thoughtful and considerate Pet-Mer who doesn’t kill her food source. She is intent on having ‘children’ or reproducing her kind. I found her positive personality comes through clearly in her journal, and she believes in her own kind. I like this writing device of telling pieces of a story through journal entries though here it’s a kind of story telling journal. The author might have shown in some way why Kesi was writing her sporadic notes. I was curious to know! This is nicely written though in a tone and style I think somewhat of as “reminiscence” which I no longer enjoy. It has a passive, dreamy quality. I prefer the more immediate, present style of writing of most fiction I’m currently reading. Overall, if you’re a vampire novel fan, Sands of Time is a unique, perhaps even moralistic take on the dilemma of being a blood drinker and is well worth checking out. This is a novella leading to more books in the series. I received a free copy from the author for an unbiased review, via notification from Bostick Communications. I enjoyed this book. The writing flowed well, and I was intrigued by where Kasi was going next, and what she would have to do to survive or have peace in her life. It does end in a to be continued that would be worth reading I think. I received a free autographed copy of this book through a a Goodreads giveaway. I was very excited to win a copy of this book since the description was very enticing. The book is very short and consists of "found" documents that have been translated through the years, then collated into this work. Ultimately, this concept did not come together very well. There was never enough time for the stories to coalesce before the book moved on to the next selection. I feel that this led to a missed opportu I received a free autographed copy of this book through a a Goodreads giveaway. This book grabbed my attention from the start. The premise is that ancient writings are discovered from various parts of the world and these writings tell the story of an ancient Vampire. It is obvious from the start that the author has done her research which adds an element of truth to the book. She is also very good at creating the "what happened next?' suspense. Without giving too much away, the book follows part of the long life of Kesi, and her travels around the world. I found the charac This book grabbed my attention from the start. The premise is that ancient writings are discovered from various parts of the world and these writings tell the story of an ancient Vampire. It is obvious from the start that the author has done her research which adds an element of truth to the book. She is also very good at creating the "what happened next?' suspense. I found the characters in Sands of Time to be believable, real and each motivated by their own truths. I genuinely cared about them all, including Yin (wait till you meet him) and could see why they behaved in the way that they did. I received this book from the author, in exchange for an honest review, and I'm very pleased that I did. Although it can be read as a standalone, there are still plenty of mysteries to be told, and I shall look forward to reading them. Sands of Time can be found on Amazon, as an ebook, for $1.47 or paperback for $7.99. Sands of Time is a collection of journal entries, pieced together by archaeologists as the bits of paper, papyrus and hemp are found. Although this collection of entries has been placed in date order, there are gaps missing, to be filled at a later date when the entries have been found. They all tell the tale of Kesi, a daughter of an original Pet Mer. This is a brilliant little novella, showing great potential and left wide open for more stories yet to come! We see how Kesi adapts to her new li Sands of Time is a collection of journal entries, pieced together by archaeologists as the bits of paper, papyrus and hemp are found. Although this collection of entries has been placed in date order, there are gaps missing, to be filled at a later date when the entries have been found. They all tell the tale of Kesi, a daughter of an original Pet Mer. This is a brilliant little novella, showing great potential and left wide open for more stories yet to come! We see how Kesi adapts to her new life (lives) and the changes she must make. Well written, in an interesting format, and with no editing or grammatical errors to disrupt the flow of reading, I would definitely recommend this book to anyone with an interest in history and vampires! 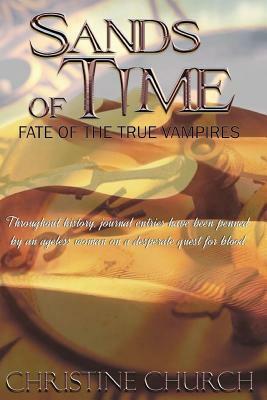 Sands of Time take the paranormal genre and turns it into a form of historical fiction, which I absolutely loved. What I would like to see more of is people researching these f I received a free copy of this book in exchange for an honest review. I have enjoyed reading the Sands of Time and not at all put off by the abrupt ending, or the realisation that the answers continue in a Book Two and Three. The value of having to learn about someone whose life extends to thousands of years, is in the acceptance of a Book Two and Three, or more. Nicely written, and interestingly presented with just the right amount of information, it never gets boring. Not bad going considering there is only so much a Vampire can do, and when done so well before, I have enjoyed reading the Sands of Time and not at all put off by the abrupt ending, or the realisation that the answers continue in a Book Two and Three. The value of having to learn about someone whose life extends to thousands of years, is in the acceptance of a Book Two and Three, or more. Nicely written, and interestingly presented with just the right amount of information, it never gets boring. Not bad going considering there is only so much a Vampire can do, and when done so well before, in such Books as 'Interview with a Vampire' I think it's a real pat on the back. SCATTERED STORIES ABOUT A VAMPIRES LIFE. THANK YOU GOODREADS FIRSTREADS FOR THIS FREE BOOK!!!! A completely original (to me, anyway) take on the origins of vampires. I really enjoyed this book. It tells the story of the Pet Mer, a race of blood drinkers from another planet, that settled in Egypt in ancient times. The structure reminded me a bit of Bram Stoker's Dracula, in that it's told by way of a journal. But it's also quite different from that book, in the sense that this journal isn't complete. Each entry is discovered and translated by modern-day archaeologists, working in different A completely original (to me, anyway) take on the origins of vampires. I really enjoyed this book. It tells the story of the Pet Mer, a race of blood drinkers from another planet, that settled in Egypt in ancient times. The structure reminded me a bit of Bram Stoker's Dracula, in that it's told by way of a journal. But it's also quite different from that book, in the sense that this journal isn't complete. Each entry is discovered and translated by modern-day archaeologists, working in different times, and carbon dated to various periods in history. As such, there are lots of gaps in the narrative, and it's up to the reader to piece them together and draw their own conclusions. It makes for a gripping read, and the time periods in which the journal entries take place (spanning history from Ancient Egypt to the French Revolution) are clearly well researched. From Egypt to France, readers are kept in suspense. My first impression is that the author chose a different form of wording and sentence structure (fabulous for the time). This story will bring you ALL over the world and have you hoping for that which has not happened for the lead character in over a thousand years. Just a wonderful new view of vampiric life! Three cheers for the originality that was given to this book! AND NO TYPE-Os! FINALLY thank you for your excellent editing! There is littl From Egypt to France, readers are kept in suspense. My first read from author Christine Church. I got this back at the beginning of December and when I saw Blood Moon was coming out figured I better get it read. An interesting trip through time, ancient Rome, Egypt and more. Well-written, with good character development, interesting twist on the vampire theme. I look forward to the next book. Interesting and different take on vampires and how they came about. I enjoyed the reading of the discovered writings and following Kesi through her life. Sad she could not bear children through normal means as she had a true love many years back. The experiments were sad. Much loss is endured in this telling of her tale. Loved how the author has this book set up like dairy entries. I think that it gives it more dramatic feel to POV from Kesi. I already have book #2 ready to go in my kindle but I saw where book 1 has a new edition. I will have to go see what that one is all about. This book gives a new view on vampires. Interesting with a quite depth that will keep you wanting more. I voluntarily agreed to review this book, and was given a free copy to do so. Outstanding book by a great author of many books. Loved this story about how vampires came to be. Impossible to stop at the first book. I enjoyed the concept and the story. I hope there are more stories written about this vampire. A wonderful tale of Egyptian times. Couldn’t get enough and ready for more. It's surely quite particular. Almost a collection of short stories with the same main character and set during different ages. It's a union between history, fiction and myth, everything linked by an unusual escamotage: the author simulates the publication of ancient scripts translated from an enigmatic language into English. The ideas regarding the vampires are quite original, and the origins of this race are interesting to discover. Even though I enjoyed enough the reading, I think that the book is a bit short, without a real ending and because of the frequent changings of setting and characters it's difficult growing fond of them. I received a free copy of the book in exchange for a review. Christine began writing at a very young age, penning and illustrating picture books at age 9. In school, she could be found sitting in the back of the class, writing short stories (she aced English and literature). By 1992 she was professionally published in both nonfiction and short stories. In 1998 her first book was traditionally published, which led to many more book deals. Church's vampire ser Christine began writing at a very young age, penning and illustrating picture books at age 9. In school, she could be found sitting in the back of the class, writing short stories (she aced English and literature). By 1992 she was professionally published in both nonfiction and short stories. In 1998 her first book was traditionally published, which led to many more book deals. Church's vampire series, Fate of the True Vampires, is a fresh look at an old genre. Book One, Sands of Time was Finalist in the 2016 Next Generation Indie Book Awards. Book Two, The Early Scrolls, won the 2017 Indie Book Awards. Beyond Every Mirror (Book One, Anachronistic Dimensions) has won two 5-Star seals through Reader's Favorite. Book Two, Beyond a Veiled Reflection is a five-star, 3-time winner's favorite through Reader's Favorite.